Posted April 30, 2012 in kinetics. 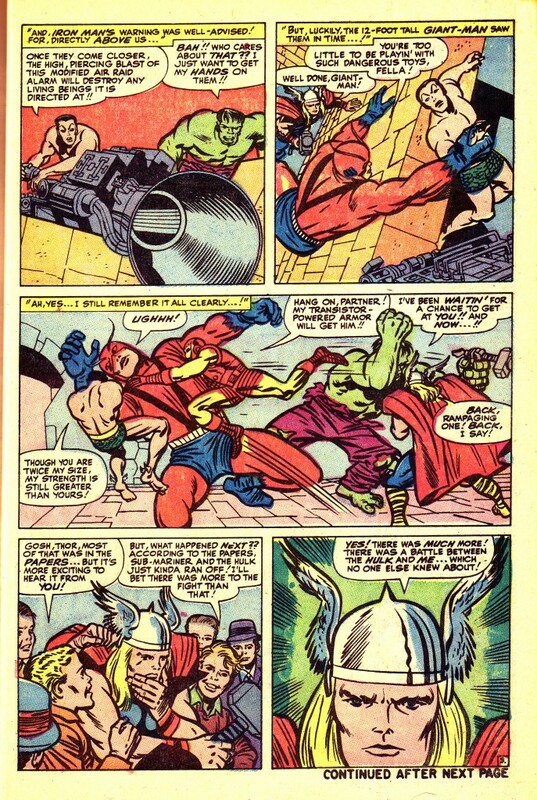 Journey Into Mystery #112, with an epic battle between Thor and the Hulk has some of my favorite Kirby Kinetic moments. The slug fest is a carry over from Avengers #3, and is a elaboration by Thor as he tells a group of youths the story when they ask which of the two combatants is stronger. The second panel of the page below has long been a favorite of mine because of the unusual angle. Its primary function is to draw the reader’s eye to the third panel, but it excels alone as a brilliant and unusual composition. Most artists would probably employ a more conventional approach, that being to have the base of the panel as the floor in the picture. In other words, Giant Man would be reaching straight up at Namor. Kirby gives us a skewed but less static picture frame, and it works beautifully for the overall page composition. Thus, he has Giant Man reaching diagonally up at Namor, who is also positioned on the diagonal of the wall. These planes are offset by the diagonal of the elaborate piece of machinery in the lower right corner. This story was drawn during a period when Kirby was doing art chores on more than half a dozen titles, and although it is drawn lovingly, it is a bit skimpy on backgrounds. Page seven is a beautiful sequence, but is not as well planned as Many of Kirby’s best. The final page is one of Kirby’s most awesome studies in sheer ferocity. 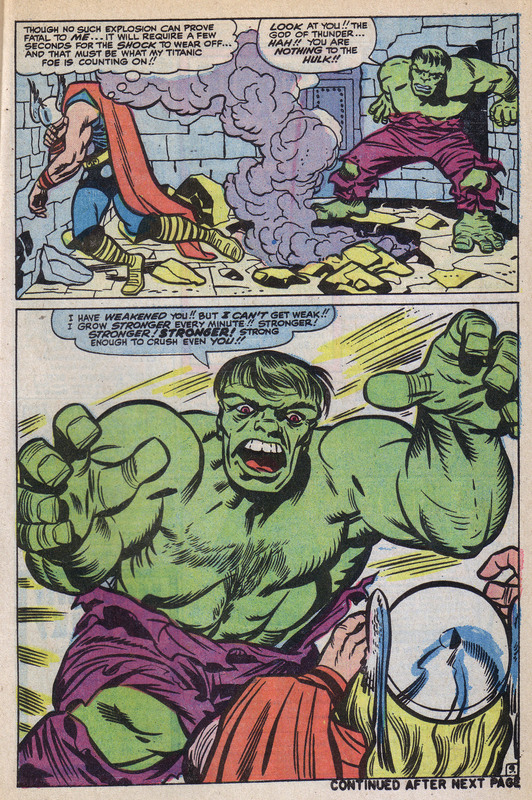 In the first panel, Thor is near collapse, stunned by an explosion, as the Hulk crouches, gloating and preparing to spring. The bottom panel gives us a masterful example of looming horror. The monstrous Hulk’s facial expression is fierce enough, but it is his massive arms and ponderous hands that visually pin Thor to the bottom right corner of the panel. 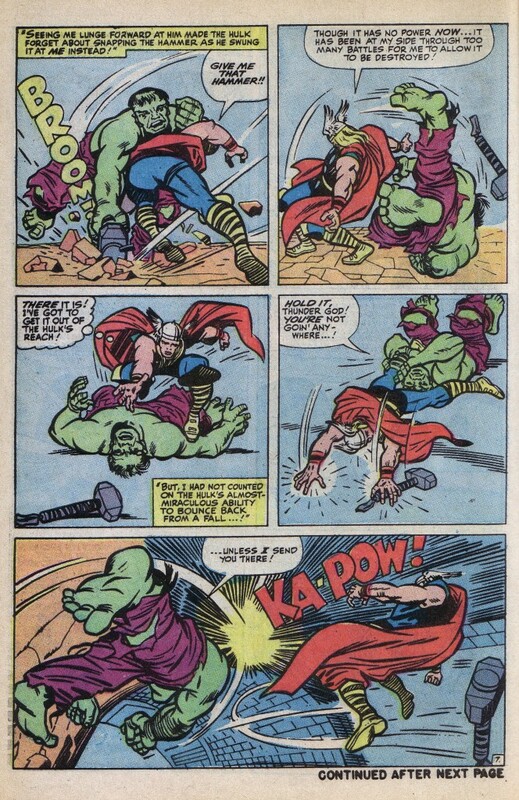 It is the left to right sweep of right hand to head to descending left elbow that squashes Thor into a cowering heap. Let me take a moment to mention an outstanding inking job by Chic Stone in this particular panel, where the powerful lines of chest and abdominal muscles of the Hulk are wonderfully rendered by the inker. This singular panel so impressed itself upon me when it first appeared, that I am surprised that I waited so long to showcase it. Such is the sheer magnitude of Kirby’s work that this sequence would only occur to me at this point in time. Blog articles are © 2009-2013 Norris Burroughs. All rights reserved.